Wow, it has taken me a really long time to write this book review and I finished this book over a month ago. I think this is a testament to how wonderful this book is and also, how difficult it is to write a review about it. 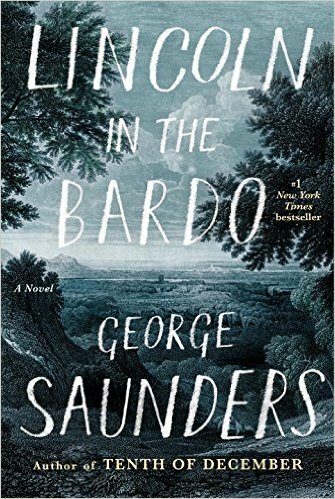 I’ve always been a very big fan of George Saunder’s short fiction, so I was very excited to read his debut novel, Lincoln in the Bardo. This novel was published this year and has received a medley of great reviews, so you can imagine my excitement to start this book. So, let’s jump right in. First, let’s start with the man, George Saunders. My first introduction to this quirky, funny, and touching writer was from his short story collection, Pastoralia. I took a writing class when I was 17 at Columbia University and one of the teachers actually read the short story, “Sea Oak” to us one day and I fell in love. That short story honestly changed my perception of how short fiction could be written – it was unlike anything I had ever read before. Immediately after she read that short story, I remember running to a book store and buying the collection. Since then, I’ve been in love with George Saunder’s writing. He’s written a total of seven short stories collections / novellas and Lincoln in the Bardo is his first novel. Now, let’s get started on the novel, Lincoln on the Bardo. The story takes place in February 1862, one year into the Civil War. Abraham Lincoln is having a tough time with the presidency as this war wages on and civilians are starting to realize how bloody, brutal and long this war is actually going to be. While all of this is happening to the nation, President Lincoln’s beloved eleven-year-old son, Willie, lies upstairs in the White House, gravely ill. Despite predictions of a recovery, Willie dies and is laid to rest in a Georgetown cemetery. Newspapers report that a grief stricken Lincoln returns, alone, to the crypt several times to hold his boy’s body. From this seed of historical truth, George Saunders writes about the drama that unfolds in the graveyard for the one night that Willie is laid to rest and his father visits him. Along with this dramatic night, we are given real excerpts from various sources during February 1862 that give us a great and hilarious context as to what is happening in both the USA and with President Lincoln and his family. This is where our story takes place, as Willie is laid to rest with these hilarious and vocal ghosts. Poor Willie has no idea that he is dead and refuses to go on to a better place, which will leave him forever stranded in the cemetery. Hans Vollman, Roger Bevins III, and the Reverend take it upon themselves to make sure that young Willie passes on, lest he become damned like another young woman who refused to pass on. The reason that Willie refuses to pass on is because President Lincoln does visit his son in his tomb. This visit causes Willie to believe that his family will come back for him. Eventually, the three men decide to possess President Lincoln in order to convince him to come back and to tell his son that he must pass on. An excerpt of unreliable memories in Lincoln in the Bardo. The story is simple and yet, it’s so long! We are not only entertained by the medley of ghosts and their stories, but we are also given sections that contain quotes from journal entries, articles, memoirs, and more, from people who actually lived during this time period. It’s fun to see how people reacted to certain situations, like a dinner party at the White House that was held while Willie was sick upstairs. There are also quotes about the type of boy Willie was and even descriptions of President Lincoln. The most striking and interesting part of this section, is how memory is totally unreliable. One person says there is a full moon, another person writes that it was cloudy and you couldn’t see the moon at all. One person describes President Lincoln as ugly, another describes him as handsome. The list goes on and on and it’s fantastic to read and really breaks up the sections. I would like to say more, but honestly, not that much happens and I don’t want to give away the beautiful ending. I will say, this novel felt like a very, very long short story and not like a novel at all. It was difficult to read and yet, totally encompassing. There were times half way through the book where I thought, wow this could really use a good edit of all of this chit chat in the cemetery, but once I finished, I felt like every single section was necessary to fully engross yourself in the world of this novel. It’s a beautiful and hardworking novel – in that it touches on how things are constantly altering and death / change are inevitable and for the better, even though it hurts. Also, the amount of research that Saunders must have done in order to create this work of art is truly admirable. From the medley of quotes, to the stories of each of the ghosts and all of the research into Lincoln and his family, you can feel the labor of love this novel was to create by Saunders. It was really appreciated and made me want to learn more about this stoic, wise and sad man we call our 16th President. So, would I recommend this novel? I definitely would. It’s very funny and touching, while also making you feel like you’re reading something from out of this world. It also really focuses on the theme of change, lost and moving on. You really feel sympathy for everyone in this story as they’ve all experienced loss – whether they’re already dead or someone close to them has died. The feeling of loss is so powerful that it allows all of the characters to come together and try to make what is already painful easier and sweeter. There are no bad characters in this novel, there are just people who are stuck in the same place and need solace.